Ida-Ore Zeolite is an organic mineral derived from the reaction of volcanic activity and an alkaline water source, either freshwater or saltwater. 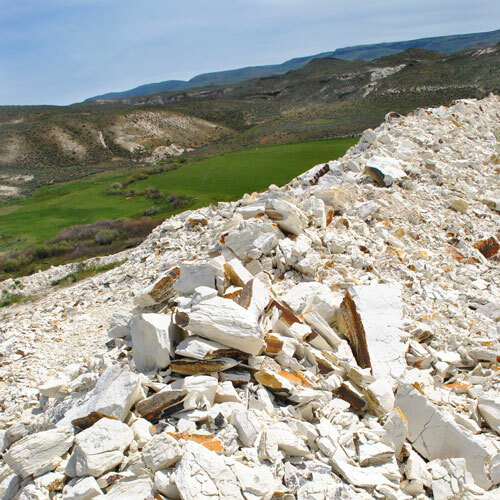 Ida-Ore Zeolite Mining sources our Clinoptilolite Zeolite material from a freshwater source to eliminate additional sodium being added to the equation to better suit the material for agricultural use. There are around 60 different forms of natural zeolites, each has unique pore sizes, filtering capabilities, durability, and specific uses. Clinoptilolite is the most commonly found and sold of the bunch. Clinoptilolite Zeolite is made up of a crystalline lattice structure, naturally arranged in a fixed and stable honeycomb framework built from aluminosilicates. Clinoptilolite Zeolite is one of nature’s rare minerals that possess a negative charge. The negatively charged alumina and neutrally charged silica tetrahedral building blocks are stacked to form the honeycomb framework. This structure allows the pores to attract and capture cations (positively charged ions) such as Ammonium, Cesium, Calcium, Magnesium, and Potassium, along with micro-nutrients such as Manganese, Zinc, Iron, Barium, and Copper making it an effective mineral fertilizer and water treatment material. The high attraction for water and numerous positively charged ions (K+, NH4+, Ca2+, Na+, and Mg2+) can be reversibly bound or released depending on the surrounding conditions (Hay, 1978). Absorption works similar to a sponge, utilizing the porous structure of the Zeolite to capture and hold water and nutrients until the plant is ready for it. Adsorption works by utilizing zeolites high Cation Exchange Capacity (CEC) value of 180 to 250 meq/100g. What makes Clinoptilolite Zeolite such a great mineral fertilizer are it’s adsorption abilities, which lets Zeolite magnetically hold and then slow release plant nutrients to prevent them from washing away while keeping them available to plants and crops. Zeolite holds ammonium and other nutrients in the crystal structure where they are not water soluble, but are plant accessible on an as-needed and time-release basis. Zeolite has a high affinity for NH4+, which is a plant usable form of nitrogen. Zeolite will also take up Ca2+ from phosphate rock, thereby releasing both phosphate and ammonium ions (Eberl D., 1993). Zeolite is not a clay. It will not break down or change structure over time. Zeolite is a “tektosilicate,” meaning it consists of three dimensional frameworks of silicon-oxygen tetrahedrals, where all four corner oxygen atoms are shared with an adjacent tetrahedral. The arrangement creates a deficiency of positive charge, which nets the negative charge that gives Zeolite the ability to exchange ions and operate as an effective soil amendment for lands and crops.